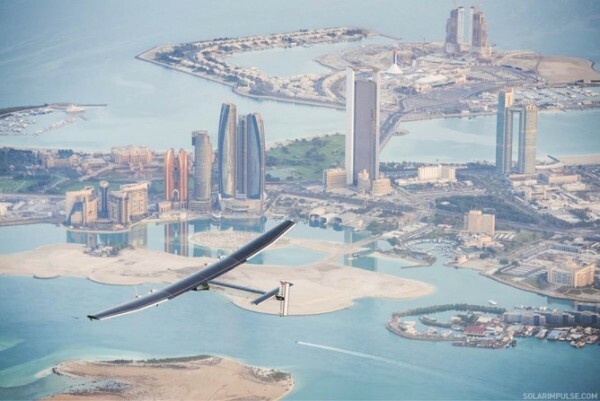 An aircraft with a 72-metre wing-span – larger than a Boeing 747 – yet weighing only 2.3 tonnes, the Solar Impulse 2 has set off from Abu Dhabi on an attempt to circumnavigate the globe powered only by the sun. If the Swiss pilot-entrepreneurs Bertrand Piccard and André Borschberg, who take turns to fly the single-seat aircraft, achieve their objective it will be a remarkable achievement and demonstration of the possibilities of solar power. A solar-powered aircraft is a huge challenge for which the aircraft’s design must be finely honed by the two key requirements of efficiency and mass. The aircraft is powered by 17,000 solar panels fitted to the wing’s upper surface which charge lithium-ion batteries in order to provide power to the four electric motors driving four-metre propellers. While the aircraft’s batteries will be fully charged at take-off, it’s essential that the solar panels can continuously provide the energy required to keep the aircraft airborne. This is complicated as the amount of energy that the panels can convert is dependent on the weather conditions, the angle of the sun in the sky, and of course whether it’s day or night. So with ideal conditions the solar panels must generate an energy surplus in order power the aircraft and keep the batteries charged in order to keep the aircraft airborne during less ideal conditions or nighttime hours. Simply put, Without direct sunlight to provide energy, the system has to be tuned for maximum energy conservation in order not to fall out of the sky. Efficiency is therefore critical in ensuring that the aircraft can eke out every joule of stored energy: components such as the electric motors, at the heart of the system, must be extremely efficient, so that no watt of power is wasted. This can be achieved by selecting an optimum motor design built with the best materials. Key materials include very powerful permanent magnets, which enable the motor to produce the torque it needs to turn. Also the specialist electrical steels that form the core of the motor which are extremely thin and offer very low electrical losses. It also tends to be the case that a heavy electric motor is the most efficient – so weight management is a real problem for a project such as this. Every kilogramme of mass added to a motor must be carried into the air by the airframe. To carry a larger mass the airframe must be heavier and more sturdy which in turn means that the greater overall weight requires more energy to get airborne, demanding larger batteries which add additional weight – an unsustainable increasing spiral. However, this can be made to work. Perhaps the most impressive example of this technology to date is the Zephyr solar-powered aircraft, developed by UK firm QinetiQ. Powered by motors developed at Newcastle University, in 2010 the pilotless Zephyr broke the record for the longest ever sustained flight of any aircraft, spending two weeks in the air. Zephyr was never designed to carry a pilot, but instead act as a replacement for satellites. Fleets of aircraft such as these could stay aloft indefinitely at altitudes of 50,000-70,000ft, beyond the reach of commercial airliners. They could offer all the communications and relay services currently provided by satellites but at a fraction of the cost required to build a space-worthy vehicle and carry it into orbit. Being closer to Earth – flying at altitudes of 25km compared to 36,000km for a geostationary satellite – generates lower losses in communication signals. This offers the possibility of low-cost, extremely high-speed communications, with no need for satellite dishes and large transmitters, and without the need for expensive infrastructure such as mobile phone towers and fibre-optic cables. Looking at it from this perspective, perhaps the biggest weakness of Solar Impulse 2 is the project’s goal of carrying two people around the world. The human crew are heavy and they need to sleep, eat and drink. They are the limiting factors, not the aircraft’s technology. While the conversion efficiency of solar panels is steadily improving, and their cost has plunged in recent years, the idea of solar-powered replacements for our fleets of airliners is perhaps fantasy. But the prospect of autonomous, pilotless aircraft with limitless range presents all sorts of opportunities and possibilities for the future.